Can you balance all your cards? Test your nerves with this game of equilibrium as you build out a tower of cards, trying not to knock any of them down. You’ll be on the edge of your seat as you slide, angle and hitch your cards in over 10 ways to win. Be the first person to get rid of all your cards or you can keep playing until the entire tower crashes. 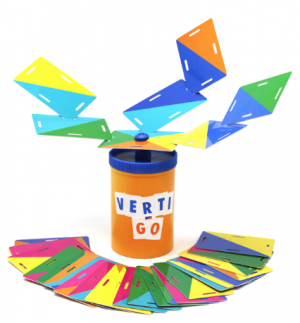 For family fun on the go, take the game anywhere in the easy to store reusable VERTI-GO can which doubles as the base for the game. Add a Review for "Verti-Go"